I'm really quite happy with how it turned out. There's even a little room to stash small desk stuff underneath. I needed a little computer monitor stand at work, so I stole a few minutes and headed to my shop. The project is very simple – just two double-stopped dados and a few small pieces of wood, and it can be done entirely with hand tools. I surfed around for other folks who’d done double-stopped dados and I wasn’t surprised to see people shying away from doing them by hand. “Use a (power) router!” was the rallying cry. Nonsense. 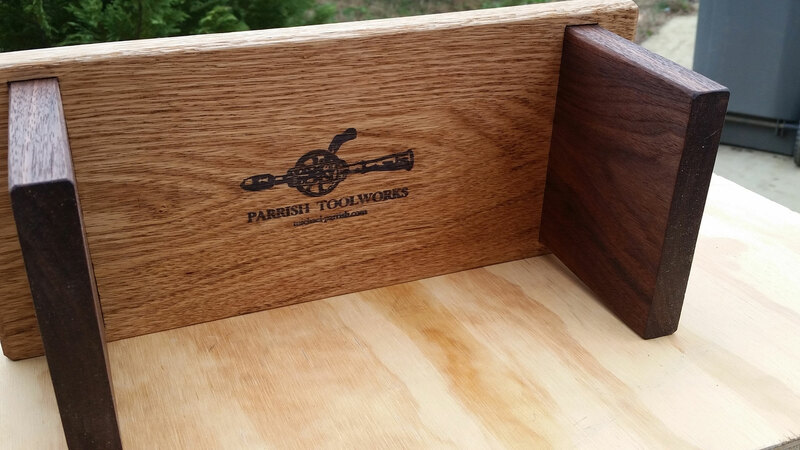 They can quite easily be done with basic hand tools and a router plane. 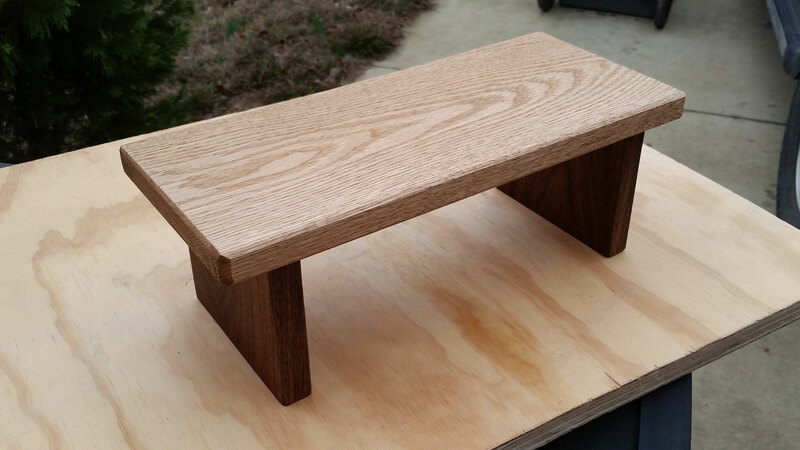 So, I first prepared three pieces of stock – a piece of 3/4″ red oak for the top and two identical, more or less square-shaped, pieces of 3/4″ walnut for the legs. There’s no need for a cross-bracing piece, since my monitor only weighs about 5 lbs. 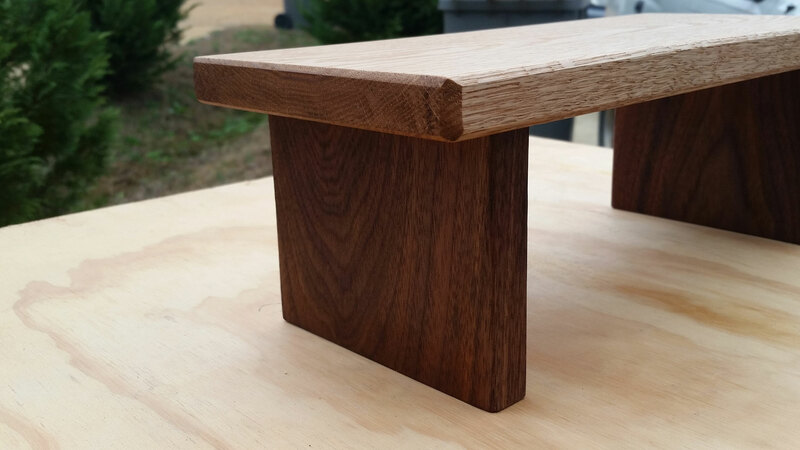 I laid out lines on the bottom with a square and marking knife that corresponded to the outer edges of the legs, and marked the front and back edges of the legs. I cut the front and back edges deeply with the marking knife, then started tapping a chisel along the outer side edge of the leg to better establish the knife wall. Next, I pared into the knife wall, creating a little shelf for the side boards to sit against, allowing me to scribe in the inner side edge, tracing directly from the board, as I held it in place. This is basically following Paul Sellers’ dado / housing joint technique (see his excellent video below), with the exception that where he was cutting a through dado, I was careful to scribe deep ends with my marking knife and stopped my chiseling at the front and back ends. Once I was happy with my depth, I used a Veritas router plane to create a smooth bottom on one stopped dado, completing the hole. I repeated the process on the other side, and I used the router plane as a depth gauge to make sure both holes were down to the same thickness. I used a plane to bevel all the edges. I rubber stamped the piece with my logo, using archival ink, prior to applying the oil. I tested the ink and oil on a scrap piece of oak first, and was pleased that the ink didn’t run once the oil was applied. A few test fittings later, I had the legs installed to the same depth and it was miraculously non-wobbly, so I went ahead and glued it up. I used a square to ensure everything was at right angles. The legs fit snugly enough not to fall out on their own, but the glue would ensure they stayed in place. After the glue dried, I sanded to 220 grit and used some danish oil and paste wax to finish the piece. 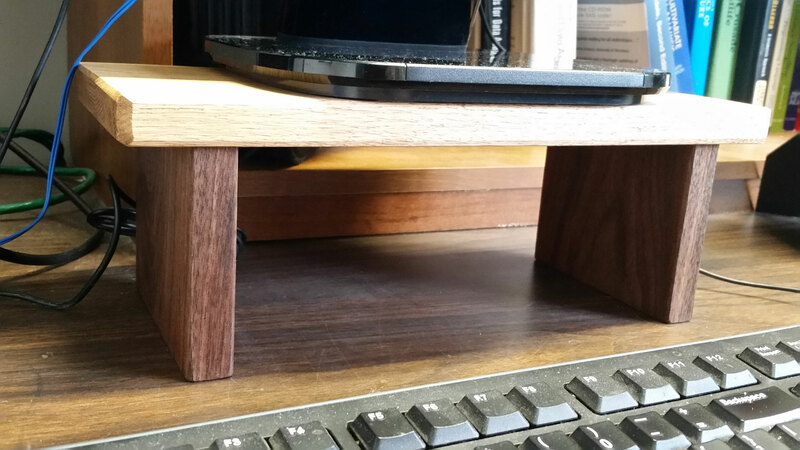 Here’s the finished monitor stand. I liked the contrast of the walnut against the oak. I’m really quite happy with how it turned out. There’s even a little room to stash small desk stuff underneath. The angle of the camera makes it look a little canted, but everything is at proper right angles. 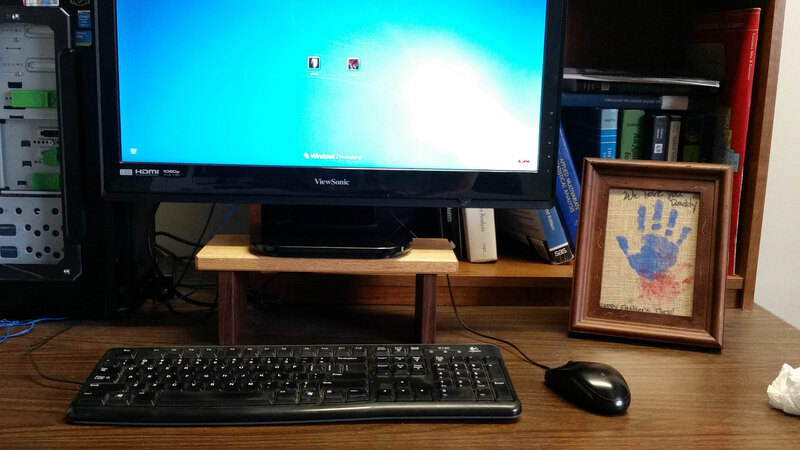 The monitor stand gets the screen to a comfortable working height and is much nicer to look at than the cardboard boxes I used to use for that purpose.